KEYLINE discussions so far have been concerned with the land areasthat contain valleys. The prime purpose of the lines of cultivation on the Keylineprinciple is to counteract the natural rapid concentration of rainfall into the valleysby an induced drift out of the valleys. At the same time the particular type of cultivationdiscussed in Chapter 4 enormously increases the absorption of rainfall into the soiland effectively uses this rainfall for progressive soil development. It is a practical impossibility to plow accurately on the contourunless every travel line of the plow is level pegged as a true contour line. Thiswould require hundreds of lines of instrument levelling in every small paddock. Whencontour cultivation is attempted it must drift mainly off the contour. 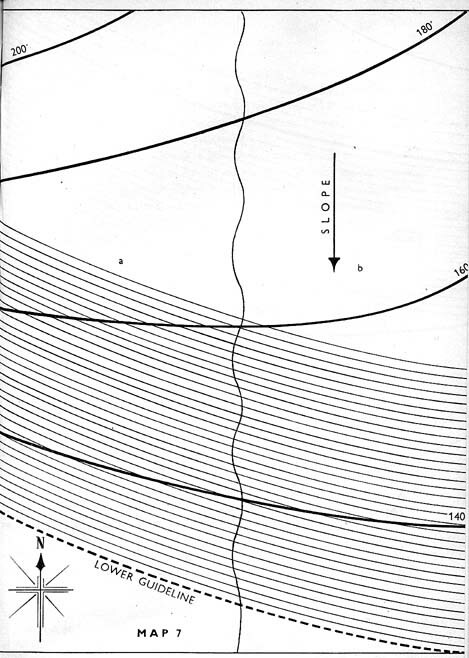 Contour linesare rarely parallel to each other. They are never parallel in undulating country. Keyline cultivation, although it may start on the contour, is soon"off the contour" by this parallel working. It is this off-the-contoureffect that is controlled in Keyline in order to counteract the natural concentrationof rain water in valleys. This controlled, and completely effective, drift-off-the-contour ofKeyline cultivation is as fully applicable to areas of land which contain no valleysor depressions. A paddock area with an even slope in one general direction is bestdeveloped from a Guideline located as high in the paddock as possible, and one thatstill gives a line of sufficient length to serve effectively as a guide for Keylinecultivation. Cultivation parallels this Guideline down the slope. The small areasleft above this Guideline are cut out in any convenient manner. If such an area containedsmall erosion gutters they would be cured by this cultivation method. Another paddock without a valley may have one side of the paddocksteeper than the other. It may be necessary to drift the moisture in one directionwhile under different circumstances the opposite may be advisable. This can be doneby Keyline cultivation, as illustrated in Maps 7 and 8. Map 7 illustrates a paddock area containing a steeper side, "a"and a flatter side "b". Assume that the area "a" is partly erodedand the whole paddock is to be Keyline improved. It will be necessary to counteractthe fast run-off to the south-west from this area by an opposing drift in cultivationfurrows away from this direction. 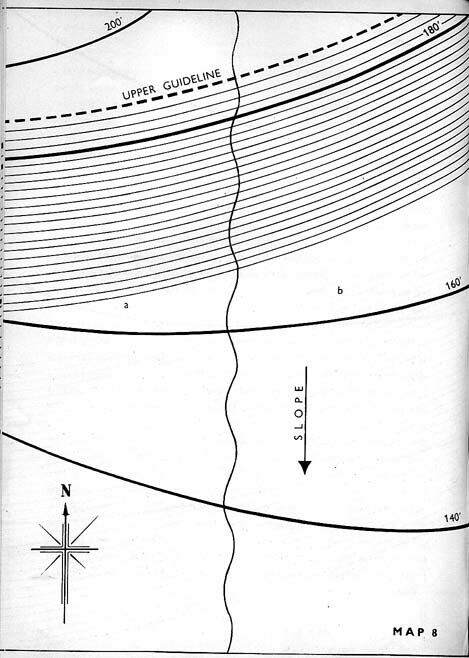 A Guideline is located, the lowest suitable inthis instance, and Keyline cultivation parallels this line up the slope of the land,as illustrated by the parallel lines of Map 7. These lines have a drift away fromthe natural run-off direction. Protection and development are thus secured. We can now assume an opposite problem on the same area. "B"in this case is wet or swampy and "a" is very dry. A drift towards "a"of the surplus moisture of "b" is desired. A Guideline is located in the highest, suitable position and Keylinecultivation parallels this Guideline down the slope of the land, as in Map 8. Thesurplus moisture of "b" now has a "drift" to the dry area "a",with the effect that both areas are immediately improved. The small areas left outof this parallel cultivation are worked out in any convenient manner. They will notaffect the effectiveness of the work. The sour wet area "b" is properly aerated for rapid improvementand surplus moisture drifts to the area "a" to improve it. Surplus moisturein these circumstances may drift along the tine furrows underground away from "b"until this area is left nicely moist, as distinct from wet. Moist soil-not wet soil-produceshealthy pasture growth. With an appreciation of the astounding effectiveness of Keyline cultivationand some experience of its use, it will be found that relative moisture content ofproblem land can be adjusted at will by the astute use of Keyline's off-the-contourtype of cultivation.